There are many reasons why visual content is becoming more widely used in online marketing, including these 19 statistics. However, it's especially important for nonprofits because every person who supports, fundraises for, donates to, and is impacted by your organization is a story worth sharing to connect others to your mission. And also, let's not forget: Some of the most compelling content, more often than not, includes visuals. There are many nonprofits setting the example for using visual content in their social media, email, and website engagement strategies. 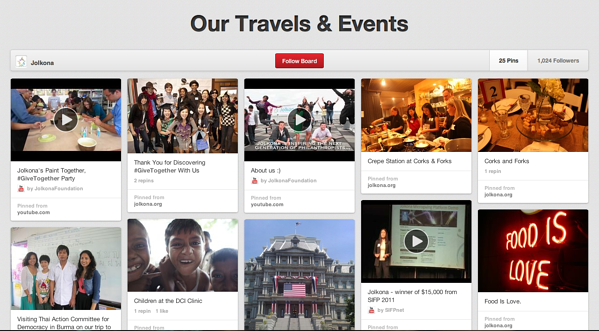 To give you some examples, I've highlighted 10 nonprofits that are implementing visual content in unique ways using Pinterest. 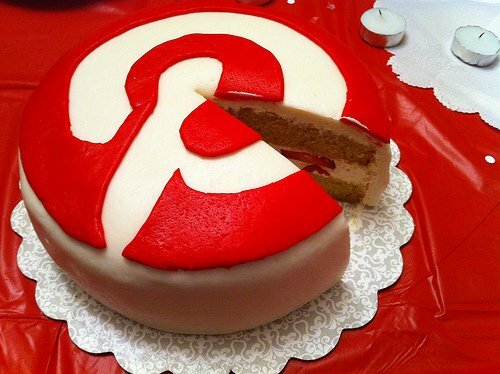 The P.INK Foundation uses Pinterest as its main website to which it sends all traffic to from its different marketing channels. The organization uses consistent branding as well as ways to connect with it directly via email and other social channels. 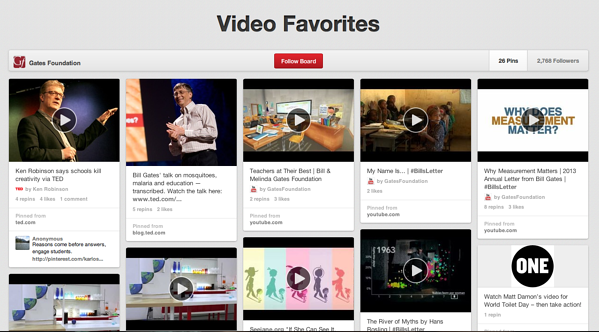 The Gates Foundation shares its favorite inspiring videos on its Pinterest account, including several TED talks by both Bill and Melinda Gates. This serves as a good reminder that Pinterest isn’t only about sharing photos, but that it can also be a great way to share your stories using videos as well. Merchandise is a great tool for brand awareness. 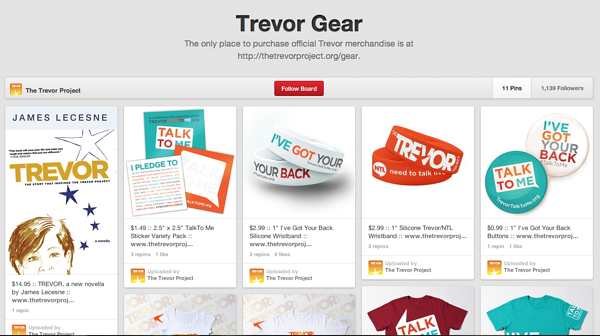 The Trevor Project dedicates a board to its “Trevor Gear,” including T-shirts, wristbands, and buttons, all with the Trevor Project's branding. 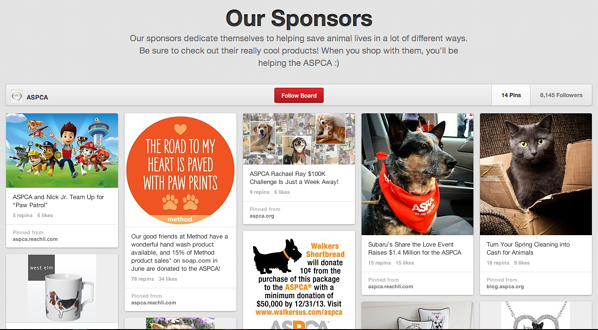 The ASPCA uses Pinterest for a number of things, including thanking its sponsors, like West Elm and Subaru. This is a phenomenal way to show appreciation to those supporting your organization. It also gives your sponsors something to share to their networks so you can leverage their audiences as well. 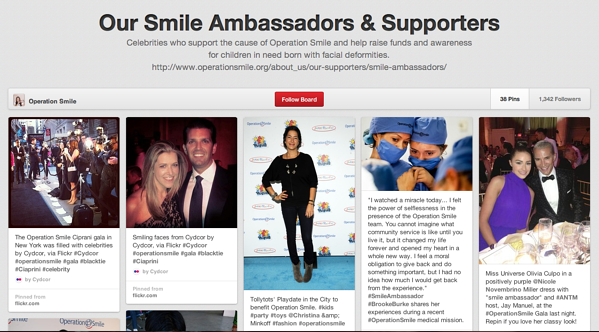 Operation Smile has a dedicated board to those celebrities who support the organization, including those who have donated, volunteered, and attended its events. 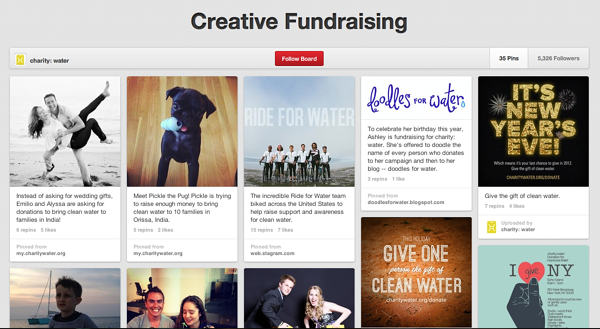 Charity: water highlights its fundraisers on its “Creative Fundraising” board. This is an ideal method to show appreciation for your fundraisers and also lead by example and inspire others to be creative in how they fundraise. Like the sponsors, board fundraisers will be sure to share the pins of their campaigns to their networks. Educating your audience about the history of your organization can seem like a giant task. 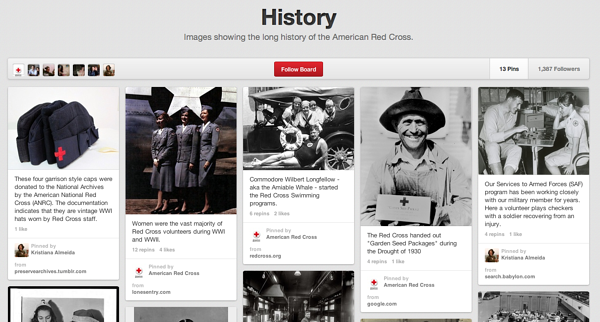 The American Red Cross, though, has a dedicated board sharing some of its history, including when the organization started and the different disaster relief events it's supported over the years. Reporting from the field is a fantastic way to connect your supporters to the impact they are making. Jolkona highlights pictures and videos from its travels and events on a dedicated board. Sharing bite-size tips and statistics is simple on Pinterest. 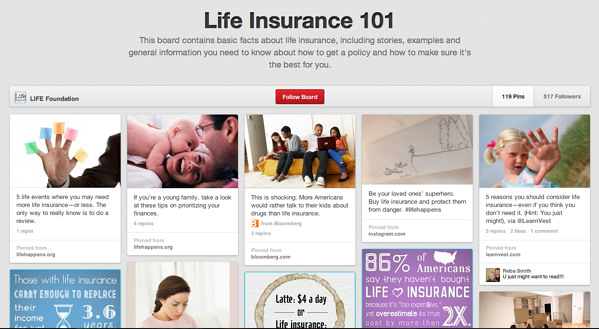 The Life Foundation has a variety of boards on different topics, including “Life Insurance 101,” to provide all the facts you’ll need to know about life insurance. Grist shares environmental news on its website, but it also educates its audiences on how to be environmentally conscious. 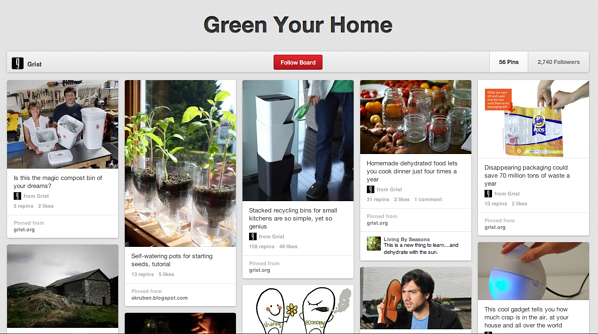 The group has a “Green Your Home” board with expert advice regarding how to reduce your carbon footprint. 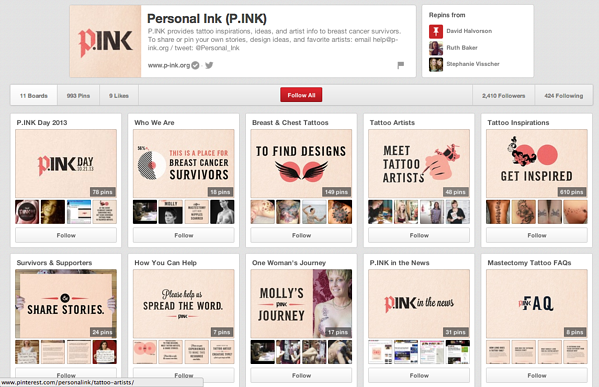 Got an interesting Pinterest board of your own, filled with amazing visual content? Tell us about it in the comments section below!